Yeah working fine for me. I didn't add a key for a long time but I can only confirm it works fine with PushBullet at the moment. 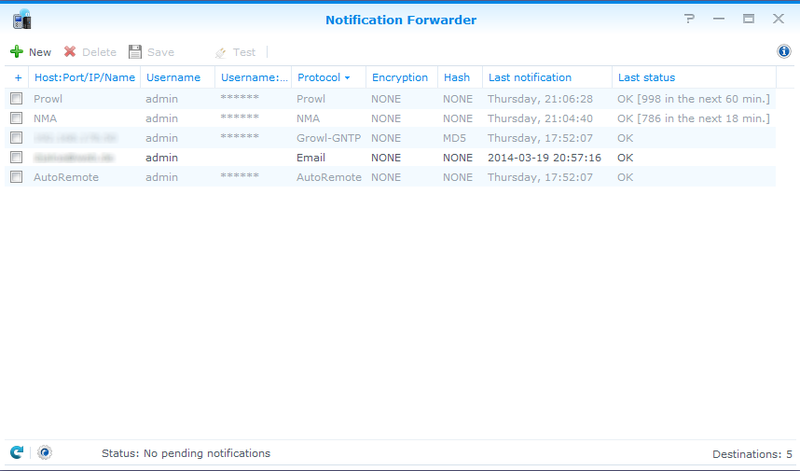 Will you add Join by Joaoapps to notification forwarder ? I recently contacted Synology to have notifications extended, and they said it was not possible until I found this gem of a package! Am I able to add protocols, for example, why is there not an option to make http calls from within this package? A simple http call to an ip address /with a url and parameters will fit my needs perfectly. This way, I can call IFTTT or a raspberry pi for some remote actions instead of notifications only. Hi, will you integrate Boxcar? Here is developer url https://boxcar.io/developer thanks!! @qtip The only non-admin running application I've seen not forwarding notifications is indeed 'Download Station', good guess. Thanks for your reply. @H3: Which application will send the message that is not be forwarded as a non-admin? It was reported that notifications from download station will not be forwarded, because the security advisor respectively apparmor blocked this. I have still no solution for this issue. Is it designed to run simultaneously on two different users? I've set two entries to Pushbullet, one for an username that has admin rights, the second with user rights. The 'test' button works fine, when I am logged in with respective users, but I only notifications from the admin user are forwarded, when generated from DSM (not the test button). Any idea? Any logfile to inspect? Any Github? 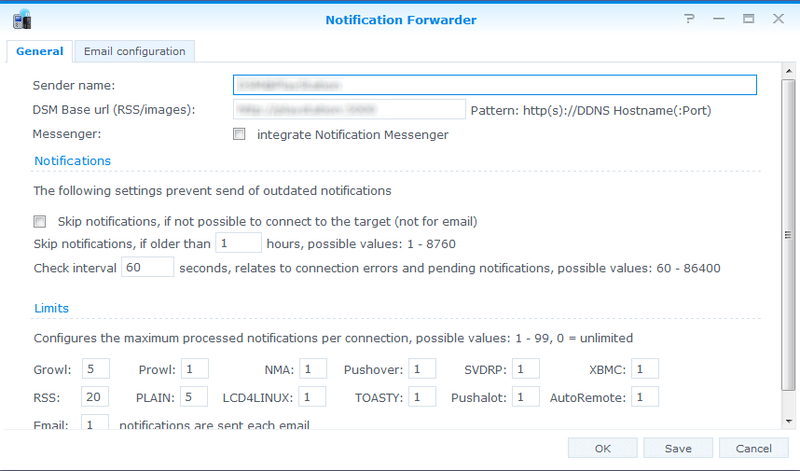 @Matt: Yes, Notification Forwarder replaced it, to be able to get any notification from dsm. The original program is still there and will be executed from the replacement at the end. I just installed DSM 5.2-5565 Update 2 and now I am getting a security alert that usr/syno/bin/synodsmnotify was changed. Does that have to do with Notification Forwarder? Hi. My DSM's language is Korean. (unicode) So, Notification message too Korean. But notification message was broken. (Maybe no support unicode?) Please fix this bug. @qtip done that, it works now, thanks.